Madonna fell off a horse again, and ended up in the hospital again. But this time the injuries weren’t as severe as they were in 2005. According to Madonna’s publicist Liz Rosenberg, the 50-year-old singer suffered “minor injuries and bruises” after falling from a horse on Saturday while riding in New York’s Hamptons. By Saturday night Madonna had been released. Rosenberg blamed the fall on paparazzi, saying they startled the horse when they jumped out from some bushes to take pictures of Madonna. At 4:24 p.m. Saturday, says Southampton Town police dispatcher Kathleen Vonatzski, Southampton Town police received a phone call that someone fell off a horse at Scuttlehole Road in Bridgehampton. One ambulance was sent to the scene, where it took Madonna to Southampton Hospital, Vonatzski says. Rosenberg said the photographers had jumped out of the bushes to snap Madonna, who was visiting friends on Eastern Long Island for the weekend. Further medical tests are to be conducted, and doctors will continue to observe Madonna, the rep added. 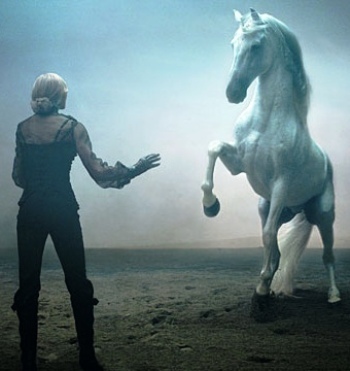 Ok, so I’m sorry that Madonna fell off a horse and got hurt – I had a traumatic horse experience has a child and I’m still scared by it – but she was riding in the Hamptons, in what I’m sure was a million dollar outfit, while visited what I am sure are very rich friends. Meanwhile, I’m sitting in my quasi-ghetto townhouse in a town that smells like cow @@@@, wearing PJ bottoms that were given to me over 3 years ago, and a tank top that is way older than that, wondering what the hell I’m doing with my life.